Sen. Mitch McConnell Insists: One And Done For Obama : It's All Politics McConnell said the only way Republicans can advance their goals was by denying Obama re-election. He was also confident the GOP won't be waiting long for Senate control since 21 Democratic seats will be in play in 2012 compared to 10 GOP seats. 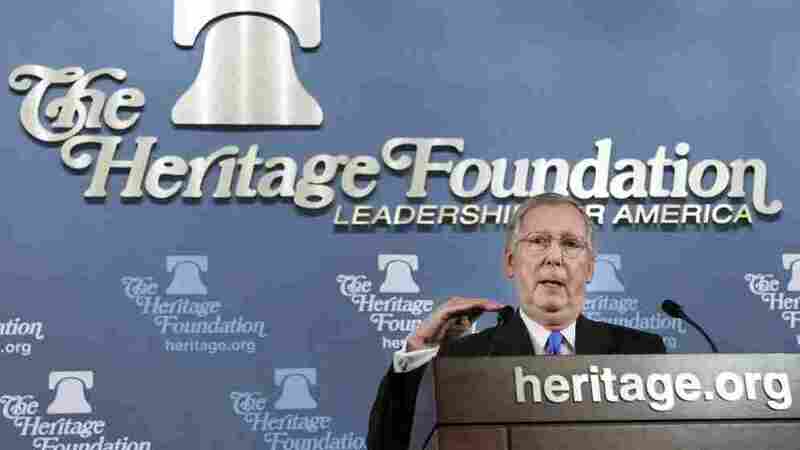 In a speech at the Heritage Foundation, Sen. Mitch McConnell (R-Ky) didn't yield an inch on his position that the main job of congressional Republican leadership is to prevent President Obama's re-election. That's the only way to get past the impediment of presidential vetoes, the Senate minority leader said. Maybe it's possible that McConnell could make himself clearer but it's hard to see how. The game is definitely on between congressional Republicans and the Democratic president. And for those who think the Democratic Senate is an impediment, McConnell clearly saw that as only a temporary problem. He said he expected some Democrats to cross the line to join Republicans on key votes. He didn't name names but Sen. Ben Nelson of Nebraska comes to mind. Meanwhile, he noted that Democrats have far more seats to defend in 2012 than Republicans do, 21 to 10. So while the Democrats now have 53 seats to the Republicans 47 seats, McConnell sounded like a man in the catbird seat.